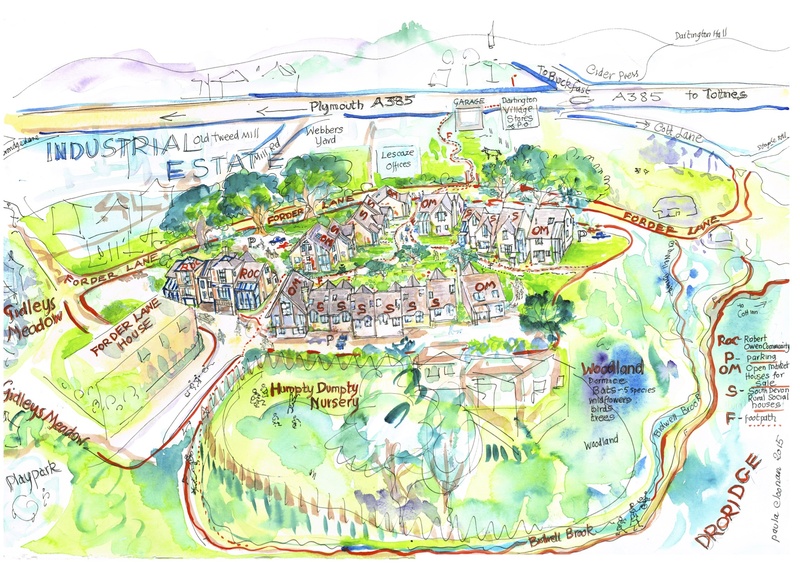 ← The Good, the Bad and the Perplexing: Dartington’s new land use map. Local residents in Dartington have been shocked and angered at South Hams District Council’s sudden decision to put the controversial Brimhay redevelopment plans to committee on 1st July – after assurances that the community would have until September to refine its alternative plans. Current plans proposed by South Devon Rural Housing Association (SDR) to build 2 blocks of 3 storey flats plus 12 houses for sale on the 0.75ha site have been met with storms of objection from Dartington residents and over 250 people have written in to SHDC to object. Concerns about overdevelopment, ugly urban design, marginalizing social tenants, who once had gardens into flats at the edge of the site have been voiced. Major traffic and safety issues plus the real loss of open amenity space and threats to wildlife, as a wild valley habitat to dormice and 5 species of bats is to be razed, were also cited. But ever creative, Dartington residents came up with their own plan – a Something Wonderful In Our Back Yard solution to the site; with high eco spec housing for private and social residents, a green garden at its heart, leaving the wild valley wild and reducing the houses on site, yet providing 12 or more fabulous cottage social homes. Offered a choice of the two schemes almost 200 have voted for the community’s, but only 2 for SDR’s. The community were finally invited to present plans to SDR on 2nd June, who said that they could work with locals and would be gifted the 12 social homes to manage. Planners called a site meeting last Tuesday, after which locals were told that the SDR plans would just go to committee for a decision on 1st July. Over the weekend local volunteers will be emailing and calling members of the Councils committee to brief them on the issues and ask for their support in delaying SDR’s plans going to committee on 1st July. In 2 months time, councillors will be able to see buildable costed and fundable plans designed by award winning sustainable designer and Daily Telegraph Builder of the Year, Bob Tomlinson. ‘ We’re not asking for money or favours’ explained Lucia Fausset ‘Just a little more time’.